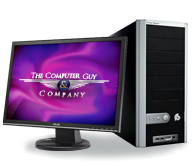 Let The Computer Guy & Company custom design and build your next computer. Our custom built computers are backed by local service warranty. 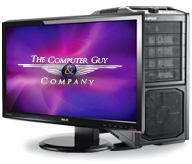 If you have a problem with your newly built custom pc you call us or bring it in and we fix it. No four hour calls to the customer "support" in India. We carry a wide array of computer cables, Keyboards, mice, hard drives, Optical Drives, and much more. If we don't have it most items we can get next day. Need an odd length patch cable? We can cut one to the exact length you need. We have computer cleaning products! 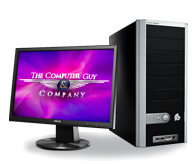 Our Custom Built Computers Are Great For basic internet / email computers, tiny bookshelf computers, midrange desktop computers, high end workhorse computers, graphics & video editing, high end gaming computers, home theater (PVR), servers, laptops/notebooks/tablet PC's and more! Custom built workhorse / game gaming computer built by the local experts at The Computer Guy & Co. Custom built deluxe computer built by the local experts at The Computer Guy & Company. Economy style custom built computer built by the local experts at The Computer Guy & Company.